I must admit something: I am a donut fiend. Yes, I’m serious. Because I donut joke about donuts. Sorry for the dad joke, but I made it up to you with these Apple Spice Baked Vegan Donuts with Cardamom Maple Icing. And no joke, these donuts are lit. If you’re not up on your 2018 slang, I just mean lit here to signify deliciously awesome. They are so incredibly flavorful that you’ll probably pause after each bite and just smile to yourself. That’s a thing people do, right? You’ll probably also lick your fingers multiple times because these donuts are sticky (in a good way). That’s because the cardamom maple icing will get all over your fingers, but hopefully some of it will make into your belly. 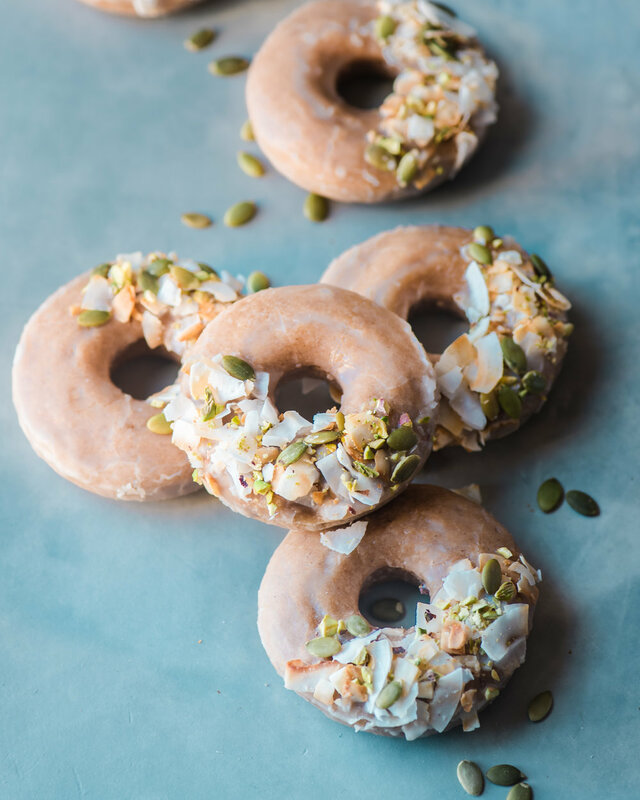 The cardamom maple icing is actually my favorite part about these donuts because cardamom packs a unique flavor punch that no other spice can. Cardamom is incredibly fragrant and boasts notes of both citrus and mint, with spicy, herbal and even woodsy undertones. Even just a pinch packs a dramatic, bold flavor, so use it sparingly. I also recommend using the highest-quality cardamom powder you can find, or grinding it yourself (in my experience, a cheap version can ruin a dish). When you make the icing, add just a tiny pinch of cardamom, taste the icing, and add more according to your taste. 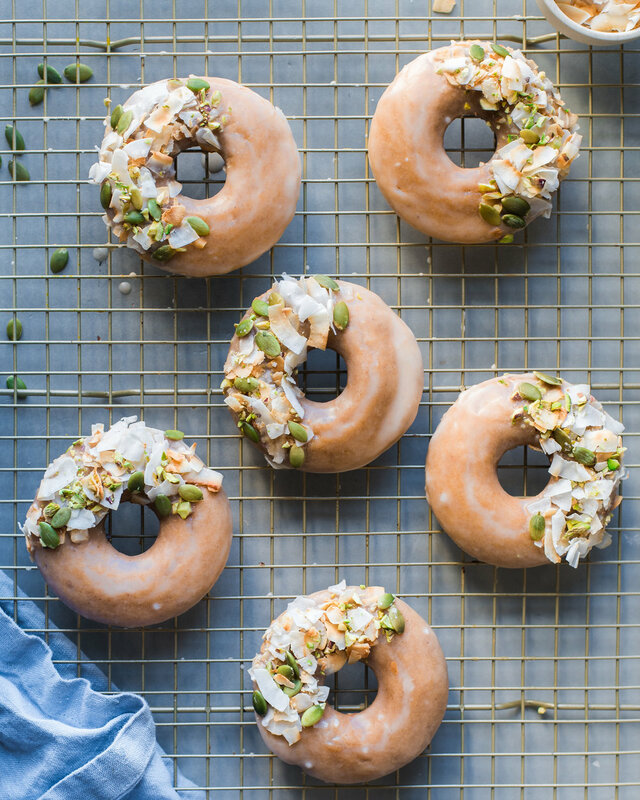 Now that we’ve talked about the irresistible cardamom maple icing, let’s talk about the donuts themselves, shall we? First, I’d like to remind you that these are baked donuts, not deep fried donuts. So if you’re expecting big doughy yeast donuts, you will be disappointed. But if you are into cake donuts that are light yet a little dense and not so heavy that you can eat two at a time, then these donuts are for you! To make baked donuts, you’ll need a donut baking pan like this. While you certainly can use a spoon to transfer the donut batter into the pan, it is a messy endeavor and may result in misshapen donuts. For a smoother process, pour the donut batter into a pastry bag fitted with a tip (or into a resealable plastic bag and snip off a tiny piece at the end), and pipe the filling into each donut cavity. Piping the donut batter is the most difficult part of this recipe. The actual donut batter is really easy to make, as it’s similar to making a standard muffin batter. Most of the flavor in the donuts comes from the apple spice mix, so don’t skimp on the spices. I also recommend using freshly grated nutmeg, as it lends a richer, more complex flavor than the pre-ground variety. I use all-purpose flour in most of my donut recipes, but if you’re gluten-free, you can use an all-purpose gluten-free flour blend instead. The donuts will be a bit denser but rest assured, they will still be very tasty. Oh, and the best part (besides the cardamom maple icing)? These donuts take just 10 minutes in the oven and require very little cooling time before you can safely pop them out of the donut pan, which means there is very little wait time between the time you start baking and the time you start devouring. 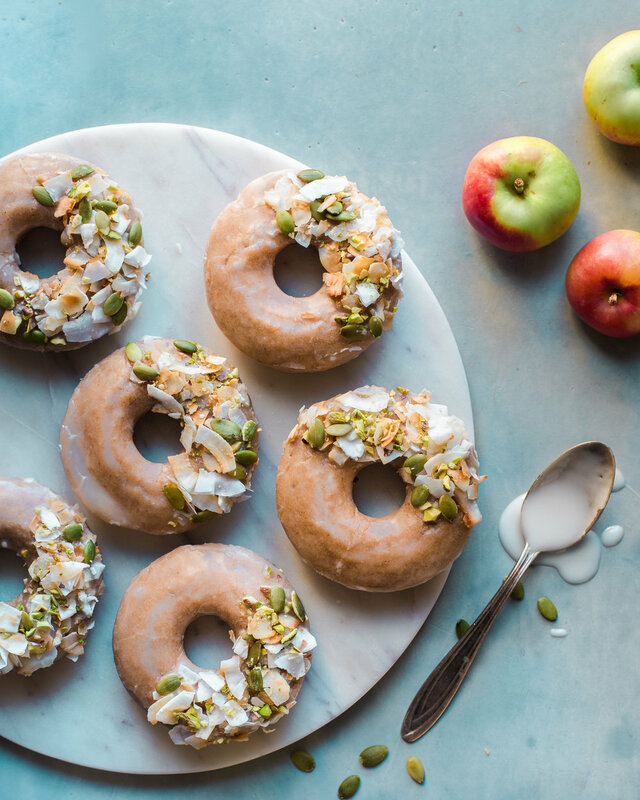 That’s about it for these Apple Spice Baked Vegan Donuts with Cardamom Maple Icing. If you try them out, leave me a comment below or tag me on Instagram! Garnishes (optional): pumpkin seeds, toasted coconut chips, and/or chopped nuts such as pistachios or pecans. Preheat the oven to 400°F (204°C). Grease two 6-cavity donut pans with melted coconut oil. Make the Apple Spice Mix: combine all of the spices in a small bowl and stir to combine. Pour the almond milk into a measuring cup and add the apple cider vinegar, whisk to combine. Allow to sit for 5-10 minutes until the mixture is slightly curdled. In a large bowl, whisk together the flour, salt, baking powder, and Apple Spice Mix. In a medium bowl, add the almond milk-vinegar mixture, applesauce, sugar, melted coconut oil, and vanilla extract. Whisk until smooth and well combined. Pour the wet ingredients into the dry ingredients and use a whisk or wooden spoon to mix until just combined, taking care to not over mix. Spoon the donut mixture into a pastry bag fitted with a tip (or into a large resealable bag with a hole cut in the corner). Pipe the donut batter into each donut cavity, filling a little more than 3/4 full. Bake the donuts for 10 minutes in the preheated oven or until a toothpick comes out clean. Transfer the donut pan to a wire rack to cool. Once cooled, flip the donut pan over onto the wire rack and lightly tap each cavity to pop out the donuts. To make the Cardamom Maple Icing, pour the powdered sugar into a large shallow bowl. Add the maple syrup and pour in the almond milk, a tablespoon at a time, whisking together until smooth and pourable but not too thin. Add a pinch of cardamom, whisk again, and taste. Add more cardamom if desired. 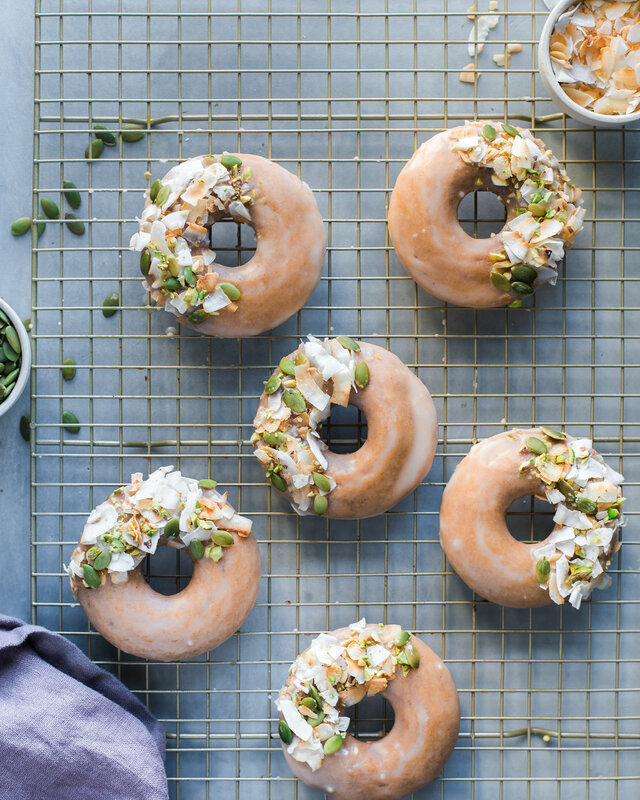 Dip each donut into the Cardamom Maple Icing, and if desired, sprinkle on chopped nuts and toasted coconut. Allow the donuts to rest for 15 minutes for the icing to set.